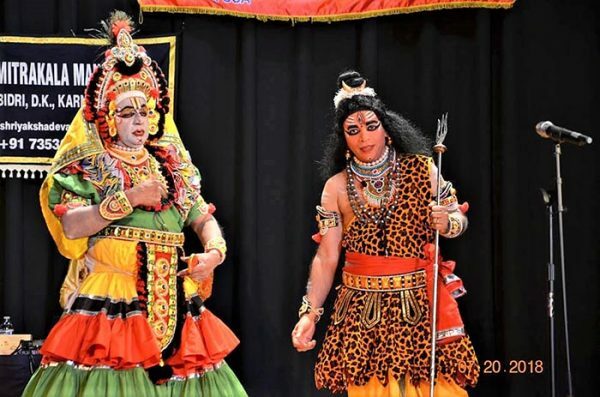 An enthralling Yakshagana “Mahisha Vadhe – Devi Mahathme” by famous Yakshagana artists from Shree Kshetra Kateel Mela and Shree Kshetra Dharmasthala Mela, took the audience to the world of Yaksha, Kinnara and Kimpurusha. 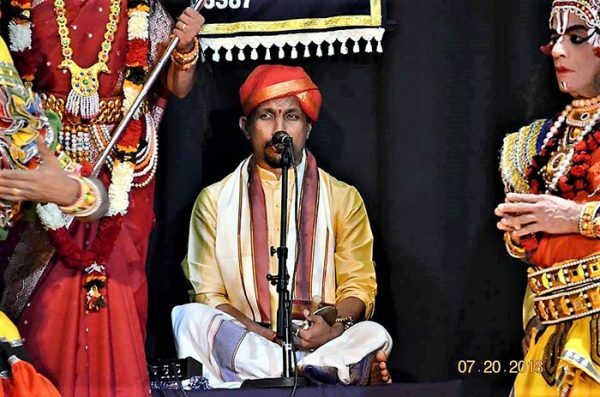 Unmatched, unparalleled, melodious voice of Patla Sathish Shetty hypnotized the audience and spellbinding act of every artist kept the audience glued for the entire program. 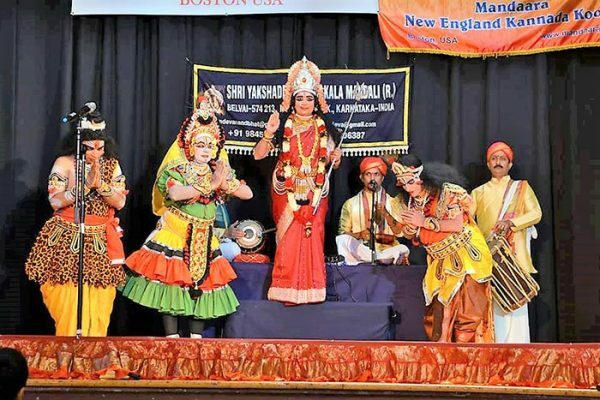 Kala Tarangini Boston, New England Tulu Koota Boston, New England Kannada Koota Boston, and Yakshaloka Boston, USA came together to organize the Yakshagana in Holliston Town Hall Boston, United States. 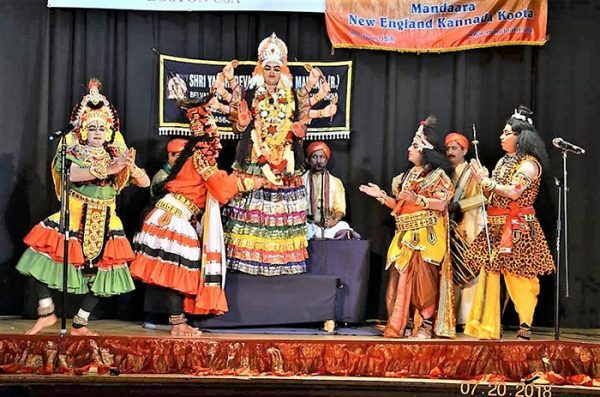 These organizations strive to link the people of American Continent having their roots in coastal and greater Karnataka by organizing such cultural activities. 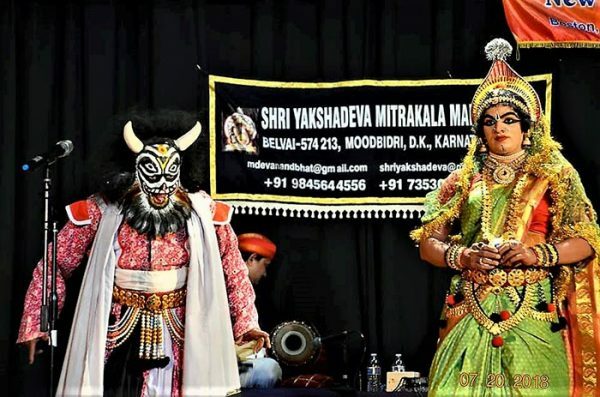 The credit of getting the artists to USA goes to team leader Mijar Devananda Bhat under Yakshadeva Mithra Kala Mandali Belvai, Moodabidre, Dakshina Kannada and various organizations across United States. 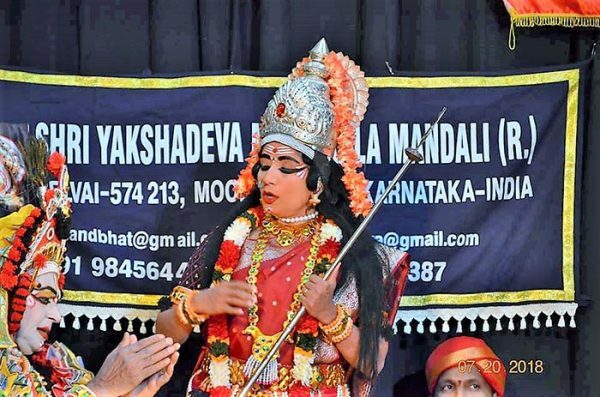 Be it a veteran Yakshagana fan or a first timer who came with curiosity, the show of storytelling with dance, drama and live music made them spellbound. Prof. Malpe Lakshminarayana Samaga, Prashanth Shetty Nelyadi, Chandrashekhar Dharmasthala, Mahesh Maniyani, Mohan Bellippadi along with a surprise package of local artists Prabhakara Bhat, Bhaskara Sherigar and Vaishali Hegde made the event mesmerizing and unforgettable. The background music was ably supported by Padmanabha Upadhya in Maddale and Mijar Devanand Bhat in Chende. The event started with light dinner, “Kadle Bajil and Tea” served during the play, made people nostalgic, took back to the memories of yesteryears, seeing yakshagana throughout the night in native place. At the end, the artists were honored by the organizing committee members. Mijar Devanada Bhat introduced the artists, briefed about the “Yaksha Dhruva Patla Foundation”, its founder Sri Patla Sathish Shetty and foundation’s commendable services to the poor artists. Visiting artist and retired Principal of MGM College Udupi, Prof. Malpe Lakshminarayana Samaga inspired the younger generation by stressing the importance of carrying forward the culture. 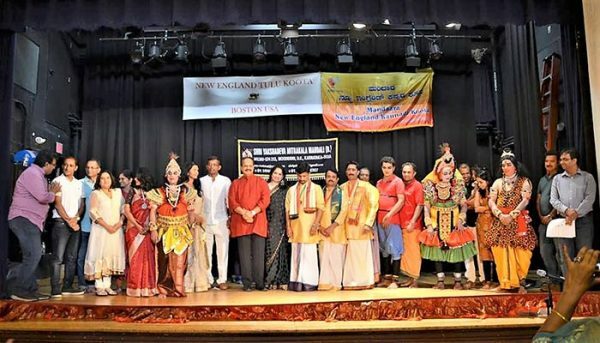 Dr. Sudhakara Rao, President of Kala Tarangini Boston, Bhaskara Sherigar Mala, President of New England Tulu Koota Boston, Madhu Mathihalli, President of New England Kannada Koota Boston and Praveena Naduthota, President of Yakshaloka Boston thanked all involved in organizing the event and making it a grand success. NRI ಡಾಕ್ಟರ್ ಜೊತೆ ಮಿಲ್ಕಿ ಬ್ಯೂಟಿ ತಮನ್ನಾ ಮದುವೆ! ತೆಕ್ಕಟ್ಟೆ ಮಾಲಾಡಿಯಲ್ಲಿ ಚಿರತೆ ಪ್ರತ್ಯಕ್ಷ: ಸೆರೆಗಾಗಿ ಬೋನಿಟ್ಟು ಮೇಕೆ ಕಟ್ಟಿದ ಇಲಾಖೆ!